Coverking Custom Seat Covers protect the original upholstery from damage, cover up any existing damage, and provide a more personalized look to a vehicle interior. Coverking Custom Seat Covers are designed to fit perfectly. Because many seats have reclining, folding and removal features, Coverking Custom Seat Covers are designed to allow complete use of the seat features. Coverking always includes headrests, armrests, console covers for split bench seats, and map pockets. 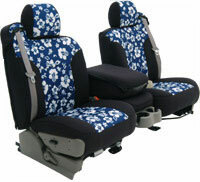 For many vehicles, Coverking offers Custom Seat Covers for the rear seats. Coverking Custom Seat Covers also have provisions for side airbags. Coverking insists on testing its materials, and offers a wide selection of colors and patterns. Embroidered GM logos such as Silverado, Corvette, Chevy and others are available. Coverking is also the only Custom Seat Cover manufacturer to be quality certified QS-9000 and TS16949. Coverking customers are thrilled with our quality. Some customers of Coverking Custom Seat Covers are simply "shocked" as to the fit and quality of our Custom Seat Covers. What does "Custom" really mean? Because there is no governing body over "Custom Auto Accessories", companies are free to classify their products as anything they would like them to be. Coverking's definition of Custom Seat Covers is a product which will fit a vehicle's seats so well that many people will mistake them for original upholstery. The fit is dependant on the pattern, and Coverking invests a lot in their patterns. To learn more about the unique Coverking Custom Patterns, click here. There is no single material which is perfect for all conditions - which is why Coverking offers a wide selection of seat cover materials. 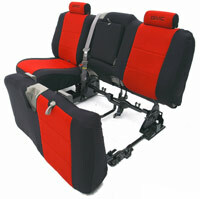 Coverking engineers and tests all seat cover materials to choose those best suited for the task. Because Coverking is the only Custom Seat Cover manufacturer certified to QS9000 and TS16949 quality standards. All Coverking Custom Seat Covers are made from tested materials. We don't buy "seconds" or "over-run" materials, and we don't sell lower grade materials as top quality. 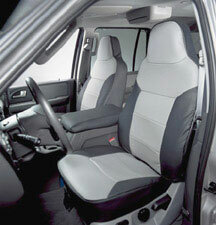 Coverking Seat Cover materials meet stringent standards for fading, flame resistance and wear. 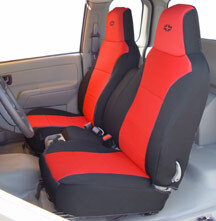 Coverking offers Custom Seat Covers in several materials and colors. If you would like, a sample swatch ring of material can be sent to you free of cost. For more information and pictures of Coverking Custom Seat Cover materials, click here. Coverking sells products which are complete out-of-the-box. 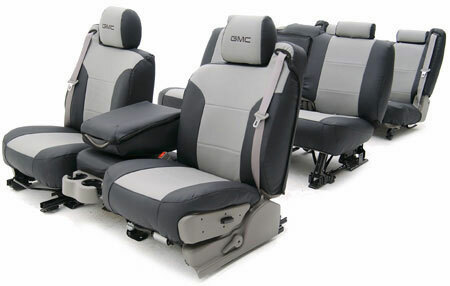 All Coverking Custom Seat Covers include EVERYTHING that is needed - headrests, armrests, console covers, map pockets, cut outs for controls, airbag flaps and provisions for seats with integrated seat belts. Coverking does not sell seat covers at a low teaser price, then charge extra for headrests, armrests, console covers, even airbag cutouts! To learn more about what Coverking includes and others charge extra for, click here. Today's vehicle seats are designed with features and functions such as integrated airbags and seatbelts, the ability to fold flat and even be removed, even electric massage. 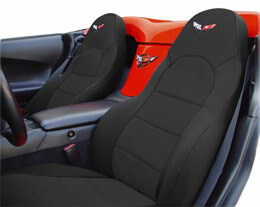 Coverking takes extra effort to design Custom Seat Covers which allow the original seat functions. To learn more about this important feature, click here. Coverking Custom Seat Covers are made in California, U.S.A. by skilled professionals working in a clean and comfortable environment. Far from a "sweatshop", Coverking Custom Seat Covers are made by people who enjoy Medical Insurance, ample opportunities for advancement, and more than a livable wage. Sometimes, well paid and happy employees mean an expensive product. Coverking uses technology and automation to keep prices down, quality up and happiness high. A heavily computerized production area optimizes every operation and results in superior quality. Coverking Custom Seat Covers are made to install easily and fit perfectly by using appropriate stitching machines, hooks, elastic and other tools to do the job right. No shortcuts are taken by trying to use only one kind of sewing operation, or skimping on attachments.